I hope you spent a lovely holiday weekend! For this week ending 4/29/11, here are links and resources shared on Twitter and tagged #practicalmktr grouped here together in Practical Simple Marketing In The News. From eMarketer, small businesses focus social efforts on top sites http://ow.ly/4Jp5P #practicalmktr Do you agree? 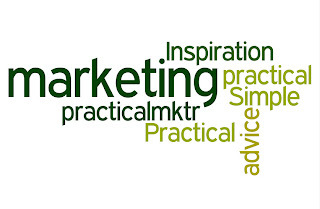 Here's a link to previous editions of Practical Simple Marketing In the News . 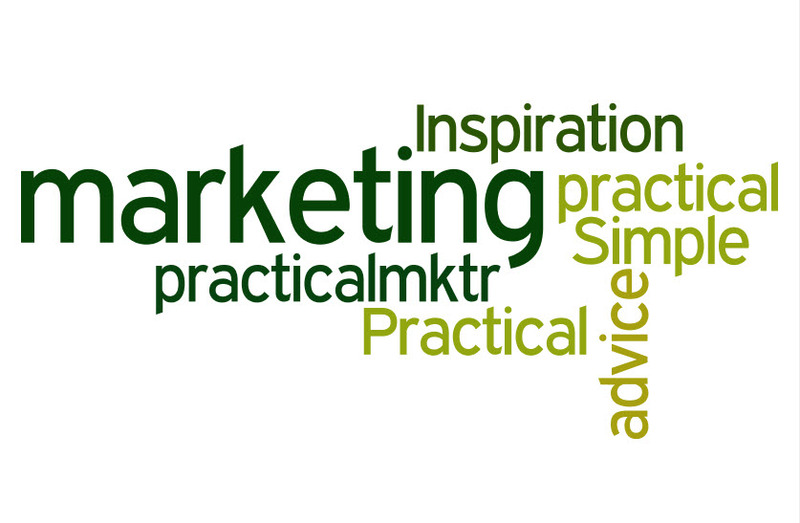 If you enjoyed this post, perhaps you would consider subscribing to Simple Marketing Blog via email updates or RSS. What about Facebook guidelines or house rules? How prevalent are they and what are some good examples? Having explored the matter from a LinkedIn perspective in LinkedIn Group Guidelines or Rules of Engagement, I was interested in turning to Facebook. My favorite Facebook House Rules example comes from the Intel Facebook Fan Page [hat tip to the wonderful Ekaterina Walter who shared her Facebook experiences in a MarketingProfs pro seminar titled Growing Your Fan Base and Engaging Effectively on Facebook. Although relatively few Facebook Fan pages include guidelines or house rules [e.g., Urban Outfitters, Zappos, Amazon, IKEA - among others - do not], I found examples more easily than I did searching for them in LinkedIn Groups. Possibly because legal teams are involved in initially creating these brand presences on Facebook Fan pages? At first, I thought that Nestle had no rules posted. But, then, I came across a note on Nestle's Facebook Policy. These House Rules from Converse All Star have to be the simplest guidelines ever! Are they enough in your opinion? I'll share with you in more detail these three Facebook Fan page guidelines: Intel, Coca-Cola's House Rules [featured on a dedicated page] and those of the U.S. Army, referred to as "Public Transit". Welcome to Intel’s Facebook page. We’re glad you are here. This page provides a place to discuss the Intel brand, our family of products, initiatives, services and breaking news. The following guidelines are designed to help provide a quality environment for our fans. Please take a minute to read them and keep them in mind whenever you participate. By using or accessing this page, you agree to comply with Facebook’s Terms and Conditions. While we are excited to hear from everyone, it is important to note that postings by fans to Intel’s Facebook page do not necessarily reflect the opinions of Intel, nor does Intel confirm their accuracy. If you have a customer service issue, we recommend going to http://www.intel.com/go/supportcommunity for the fastest path to resolution. This is your Fan Page and we encourage you to leave comments, photos, videos, and links here. However, we will review all comments and will remove any that are inappropriate or offensive. We will leave what you share that relates to the subjects covered on this Page. 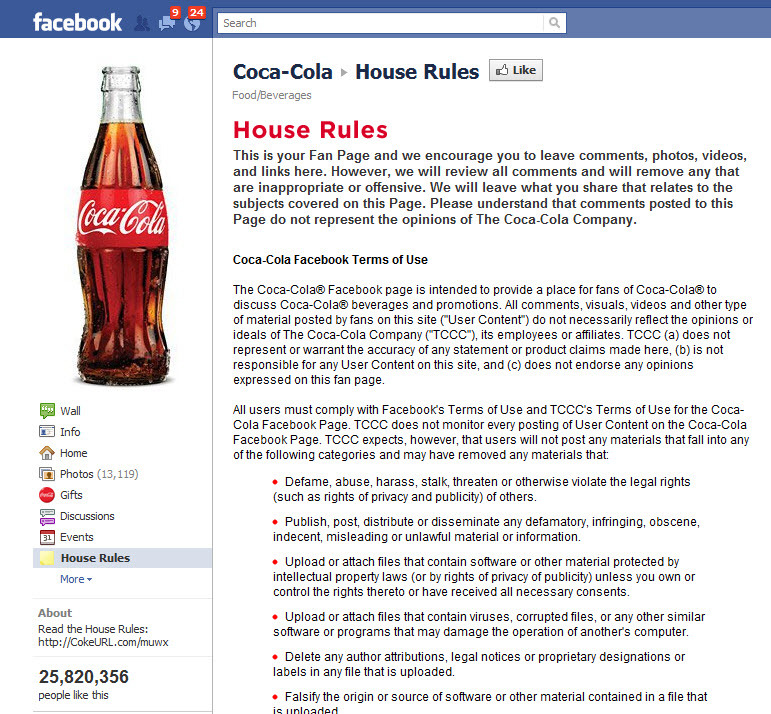 Please understand that comments posted to this Page do not represent the opinions of The Coca-Cola Company. The Coca-Cola® Facebook page is intended to provide a place for fans of Coca-Cola® to discuss Coca-Cola® beverages and promotions. All comments, visuals, videos and other type of material posted by fans on this site ("User Content") do not necessarily reflect the opinions or ideals of The Coca-Cola Company ("TCCC"), its employees or affiliates. TCCC (a) does not represent or warrant the accuracy of any statement or product claims made here, (b) is not responsible for any User Content on this site, and (c) does not endorse any opinions expressed on this fan page. Welcome to the U.S. Army's Official page on Facebook, where you will find the most recent news stories, videos and photos that are distributed by the U.S. Army's Office of the Chief of Public Affairs. If you're looking for the official source of information about the U.S. Army please visit our homepage at http://www.army.mil/. On Facebook, we hope you'll join us here and check out our profiles on: Flickr, Twitter and You Tube and the Army's official blog, ArmyLive. While this is an open forum, it's also a family friendly one, so please keep your comments and wall posts clean. In addition to keeping it family friendly, we ask that you follow our posting guidelines here. Posts will be removed if they violate the guidelines listed below. - No graphic, obscene, explicit or racial comments or submissions nor do we allow comments that are abusive, hateful or intended to defame anyone or any organization. - No solicitations or advertisements. This includes promotion or endorsement of any financial, commercial or non-governmental agency. Similarly, we do not allow attempts to defame or defraud any financial, commercial or non-governmental agency. - No copyrighted or trademarked images or graphics. Imagery should be owned by the user. - No comments or photos that suggest or encourage illegal activity. - No documents of any kind should be posted on this page. For more information, visit the DoD Social Media user agreement. Three examples from three large organizations. Certainly, much more detailed than the Converse example. Considering, though, that these are House Rules and the message serious, the tone is relatively conversational making the rules of engagement easy to understand and setting expectations for those wanting to interact with the Facebook Fan Page. 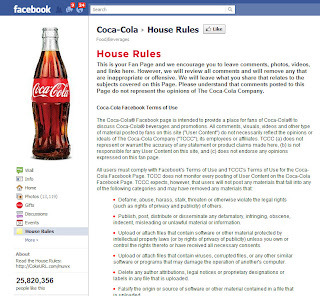 What is your take on these Facebook Fan Page Guidelines or House Rules? What would you add? What would you do differently? In case you didn't catch my MarketingProfs article about 10 (Business) Reasons To Participate in Social Media, I've got just the summary for you! Also from MarketingProfs, it's a Get to the Point Small Business recap titled 10 Reasons You Shouldn't Ignore Social Media. Go on. It's a quick read and should whet your appetite for the full article. Luckily, even if you don't read the full article, you'll get enough substance to get you thinking about the benefits of participating in social media for your business. Now, I'm sure you have reasons. For having ignored social media or perhaps for starting to consider it. Would you share them? Why might you be ignoring social media? The original article includes some other wonderful ideas in the comments. Perhaps those ideas trigger others? So, tell me. Why shouldn't you ignore social media? If you enjoyed this post, perhaps you'll consider subscribing to Simple Marketing Blog via email updates or RSS. Thanks! April 2011 Social Flooring Index Update Just Released! 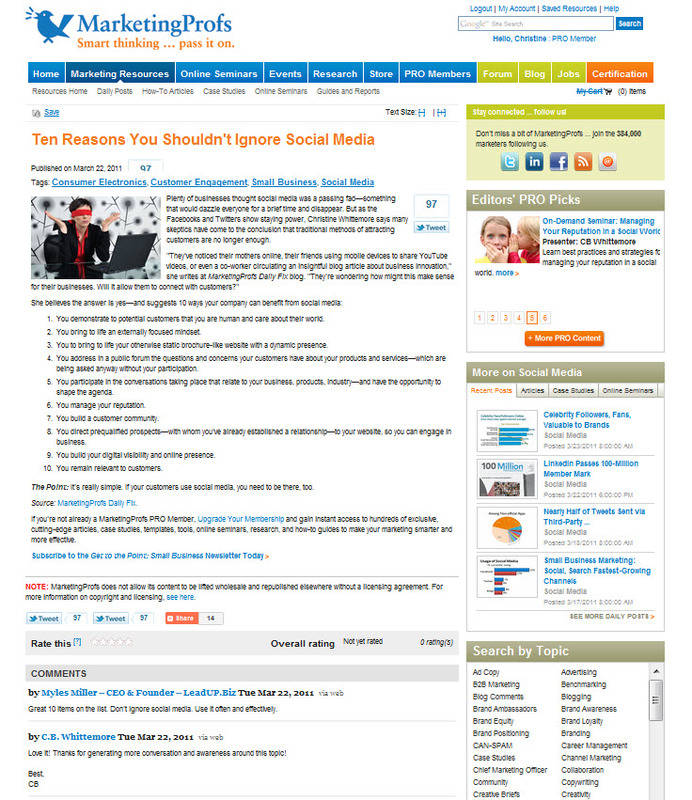 Kinnelon, NJ – Simple Marketing Now LLC’s April 2011 update to the Social Flooring Index analyzes the flooring industry’s involvement with social media marketing tools, with particular emphasis on blogs. The Carpet and Rug Institute Blog, established in April 2009, continues as most influential. 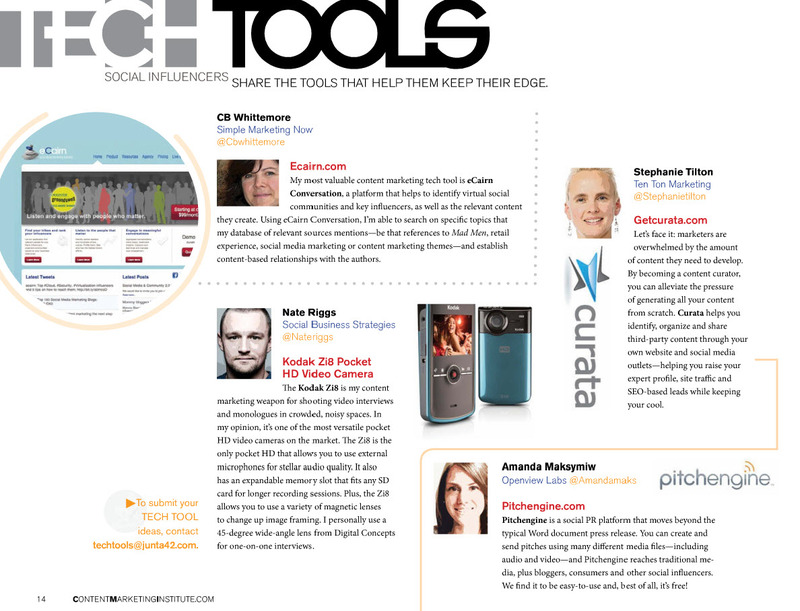 The April 2011 update to the Social Flooring Index includes 168 blogs focused on flooring and flooring related content. This is in contrast to 88 blogs in August 2010 and 53 in April 2010. These 168 blogs have generated 7,571 conversations over the past 6 months which translates to 1.877 blog posts per week compared to .7254 posts per week in August 2010. • 20 of 168 blogs have high and medium influence in the flooring social media community. • The Carpet and Rug Institute Blog ranks highest. • Although the majority of the blogs included in the Social Flooring Index are North America based, their geographic distribution suggests opportunity for more flooring blogs to develop. • A majority of the Social Flooring Index blogs have not fully integrated their activities in social networking platforms. • Three social ‘tribes’ have started to develop focusing on the CRI Blog, BuildDirect and the Social Flooring Index. • Blogs included in the Social Flooring Index have as yet unexplored opportunity to connect with one another. Doing so will create a stronger network. • The rate of blog post publishing has increased from .7254 posts per week in August 2010 to 1.877. • 43% of conversations specifically mention flooring products compared to 65% in August 2010. Other conversations address broader topics. “Social media marketing tools – such as blogs – offer floor covering companies an effective means for connecting with core customers and establishing trust with them,” says Christine B. Whittemore, chief simplifier of Simple Marketing Now. Credibility and trustworthiness in social media marketing tools is built by publishing high quality and customer relevant content consistently over time. Relevance comes from addressing topics, issues and concerns to customers in terms customers understand and relate to. Credibility comes from being transparent, connected [i.e., ‘social’] with others in the flooring community and willing to interact as human beings rather than as impersonal marketers. “Consumers continue to be skeptical of marketing claims. They are also overwhelmed with the complexity of the flooring purchase process and looking for signs of trustworthiness and credibility before making a purchase decision. They are doing so online. When done correctly, blogs represent ideal communication tools for engaging with those customers!” adds Whittemore. The Social Flooring Index represents a special case of Simple Marketing Now’s Social Ranking Index for business. It provides a direct measurement of flooring industry companies’ use and integration of social media marketing tools into their day to day business. It clearly highlights who is, and who is not, making use of the new tools. Whittemore continues to add new flooring resources to the Social Flooring Index which is available by visiting http://www.SocialFlooringIndex.com . She has also started to evaluate individual flooring blogs and is accepting submissions. For information about Simple Marketing Now and the Social Flooring Index, visit http://SimpleMarketingNow.com. 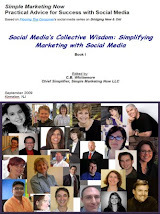 Or, simply contact Whittemore at cbwhittemore@SimpleMarketingNow.com. For more information, visit Simple Marketing Now. As I announced in FCA Network 2011 Annual Convention Focused on ‘Getting More for Less’, I had the honor of meeting & interacting with, and presenting to, the members of the FCA Network, an alliance of floor covering retailers, at their annual convention which took place March 27 & 28 in Chicago. I particularly enjoyed working with Olga Robertson, president, FCA Network, pictured on the left. She is passionate about providing her members with the support they need to compete and win and brought to life the convention theme of 'Getting More For Less'; she's also fascinating to talk to and one of few women leaders in the flooring industry. John Godwin from Shaw presented information about the consumer marketplace and residential flooring trends, highlighting the foreclosure process and the implications for floor covering retailers. Sadly, I missed both Maxine's and John's presentations. However, everyone who heard them speak was abuzz with ideas and ready to share with me their observations during that first evening. That's also when I finally - after almost bumping into her several times over the past year+ - met Emily Hooper from Floor Covering News, who has brought FCN to life on Facebook, Twitter and via the FloorCoveringNews Blog. The next day, I got to discuss my favorite topics: the retail experience & marketing to women - I definitely channeled Paco Underhill - and how to increase your digital visibility to better connect with customers. In preparation for my presentations, I spoke with three FCA Network members who graciously described their experiences connecting with customers in this economic environment and navigating through the rapidly evolving digital world. 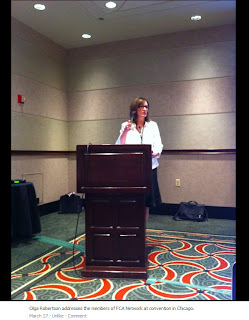 Thanks to Emily, here is a brief video clip from one of my presentations. You can find it on floorcoveringnews or view it directly on YouTube by clicking on the link titled Why social networking is not new and scary technology. 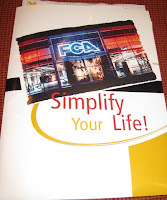 Here is Emily's article on the event: FCA Network Convention defines today's consumer. Thank you, Olga, Bob Hill, the FCA Network staff and the many gracious and wonderful FCA Network members I met for inviting me and making me feel so welcome. I hope you'll let me know about your successes trying new digital approaches for connecting with customers and how you enhance your retail experience to better connect with women customers. Have you given thought to your LinkedIn Group Guidelines or Rules of Engagement? It's an important question, and yet one that many group owners, managers and moderators haven't addressed. I wonder if I can pick your brain a little? In your presentation and in our conversations you’ve said that “rules” should be created for those of us that have a group on Linkedin. For the life of me, I cannot find any examples! Is it just that not too many groups are actually making rules, or are they hiding somewhere in their page where I cannot see them? I looked under all the groups of which we are members and there aren’t any. Can you send me an example? When I read Tricia's email, I immediately went to the HIMSS group and found their guidelines. 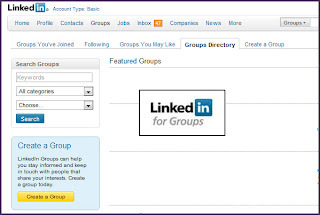 But, then I became curious and decided to check out more of the groups I belong to in search of LinkedIn Group Guidelines or Rules. And I had difficulty! Many LinkedIn Groups aren't that vibrant and others, too self-promotional. The ones that shine are ones where the group owner actively moderates, invites conversation and encourages the sharing of true value with members. Regardless, I expected to trip over more examples of LinkedIn Group Rules and Guidelines to share with Tricia. What has been your experience? 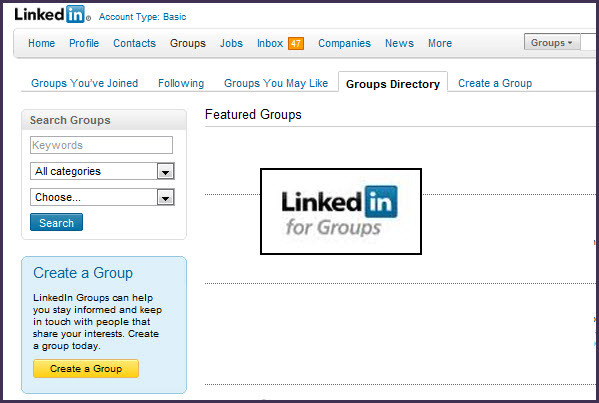 Which LinkedIn Groups do you consider most vibrant and what are their guidelines? How are those guidelines and rules of engagement communicated? The purpose of this group is to connect and discuss character-based leadership. You will notice that self-promotion is generally ignored. People in this community connect and share openly about leadership, but if all you do is talk about yourself, people will lose interest quickly. Promoting other groups or services that don't have to do with leadership development will cause us to move your discussions to the Promotions area, or ban you altogether. Please read the following rules of engagement before posting. They are designed to ensure the HIMSS Group remains professional, vibrant, and useful for all group members. Since there are gray areas for such rules, HIMSS Group moderators reserve the right to interpret the rules of engagement so the group can successfully lead change in the health IT and management systems field through knowledge sharing and communications. Although, HIMSS staff moderates the group, members are encouraged to help the moderators in this process by reading and following the Rules of Engagement, flagging inappropriate content and inform a moderator of spam and inappropriate content. RULE #1: All discussions and shared links must clearly relate to the health IT and management systems field. RULE # 2: Discussions should advance the professional development of health IT and management systems professionals. RULE #3: Discussions must clearly invite member response and participation. When posting discussions or sharing links, pose questions to garner quality conversations. RULE #4: Discussion items must be self-contained. While articles, blogs or other reputable health IT and management systems sources may support a good discussion, these resources cannot substitute a discussion. RULE #5: Be professional, kind, polite and respectful of other members. RULE #6: Promotions of products and services (even when free) are not allowed. RULE #7: Job posts are not allowed. This includes messages that advertise job opportunities; recruit candidates; feature resumes and applications, or that self-promote one’s availability for positions. If you are in the process of seeking a new position or looking to hire a new candidate, visit HIMSS JobMine at http://www.himss.org/jobmine. • Sending multiple unsolicited messages to group members. Substantiated complaints will result in the spammer being removed and blocked from the group. • Posting the same discussion repeatedly in order to promote a product, service or company. • Posting commercial comments in discussions when such comments have nothing to do with the discussion. • Posting comments in one’s own discussion for the sole purpose of making it go to the top of discussions. RULE #9: General invitations to connect are not allowed in the discussions forum. Thanks, Tricia, for the question. For those of you with LinkedIn Group Guidelines and Rules experience, what would you add to these examples? What other examples have you come across? 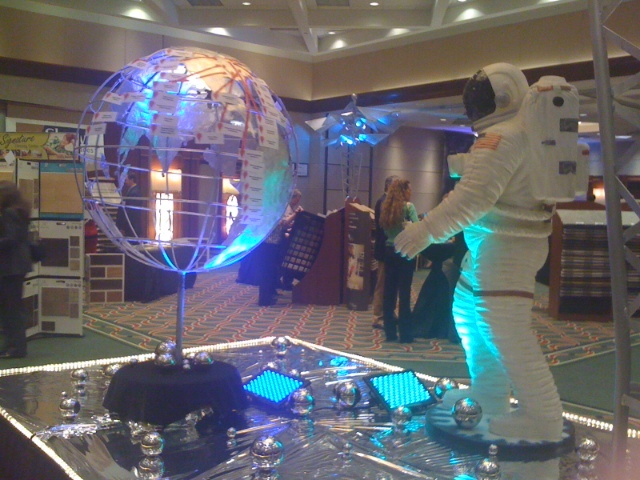 Kinnelon, NJ – FCA Network, Inc., an alliance of floor covering retailers, held its annual convention on March 27 & 28, 2011 in Chicago, IL. The convention’s theme focused on “Getting More for Less” while highlighting the rapidly changing consumer marketplace and how to remain competitive. Christine Whittemore, chief simplifier of Simple Marketing Now, shared marketplace insights about the retail experience, marketing to women and how to become more digitally visible. In her presentations, Whittemore not only described how to reach women flooring consumers via a more engaging retail experience, but also detailed how to increase retailers’ online visibility using content marketing and social media marketing to connect with customers. She included best practices and highlighted examples from FCA Network members. Other presentations featured Maxine Lauer, Sphere Trending, who addressed generational expectations surrounding digital trends, while Shaw’s John Godwin discussed residential flooring trends, including the 500 day cycle associated with refurbishing foreclosed homes. Owners and managers from 57 FCA Network member stores around the country attended the annual event. “This annual convention is a terrific opportunity for FCA Network members to learn from one another, share best practices and return to their stores and businesses recharged,” added Robertson. FCA Network specializes in providing full service retailers in secondary markets the support they need to compete and win. It supplies products, pricing and expertise to the Shop @ Home segment of the flooring industry. For information about becoming a member of FCA Network, contact Robertson through www.fcanetwork.net or call direct at 877-858-2580. Floor Covering Associates, Inc. (FCA) was founded in 1976 as a single store in Shorewood, Illinois that supplied carpet and vinyl flooring to custom home builders. Steady growth over the last 30 years has resulted in the addition of company owned locations, partnership locations and licensed stores. Now, FCA is one of the top 20 retail floor covering operations in the country, with corporately owned locations in the Chicago area that do upwards of $40 million in sales per year. 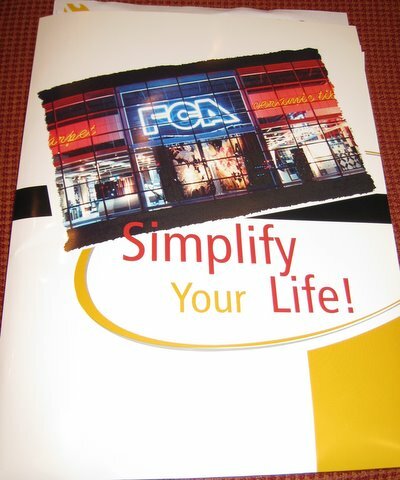 In 1998, FCA Network was formed with the purpose of providing independent retailers the opportunity to take advantage of FCA's successful marketing, merchandising and sales generating programs, while still maintaining their autonomy. With continuing manufacturer consolidation and competition, independent retailers need an edge that will differentiate them from their competition. Last week, April 7 and 8, 2011, the Surfaces/StonExpo Education Advisory Council met in Dallas, TX for the yearly planning meeting to hash out the direction of the 2012 Education Program. The meeting takes place at Hanley Wood Exhibitions offices. We meet initially as a full group, and then break into two groups to specifically address Surfaces and StonExpo separately. We then come back together again to review, further discuss [or debate] education sessions before returning home. This is the second time that the two industry shows - Surfaces and StonExpo - have come together. The implications for the education program mean that some sessions remain unique to each show and others are relevant to attendees of both shows. As you can imagine, when we break into separate groups, the focus in on each industry's specific educational needs. Next, we review the program submissions, decide which topics make sense given the environment, make sure that core/hot/new topics have been covered and then re-evaluate in case the same subject has been addressed too many times or not enough. On the Surfaces side, we reviewed in detail several hundred Surfaces-focused education program submissions! StonExpo did the same with their submissions. As Chelsie Thornton commented, "I don’t know about the Surfaces group, but on the StonExpo side, we seemed to be working feverishly to cover everything thoroughly during our brief day and a half time together!" The last part of the process brings both groups back together to review a merged listing of proposed education program topics, debate which stay or go and which need additional followup. We don't stop until the program outline makes sense to all in the room. Here are the members of the Surfaces/StonExpo Education Advisory Council who attended the April meeting. Sebastiano Brancoli, The Consultants International Group, Inc.
Rodney Harvey, Curtain Wall Design & Consulting, Inc.
From Hanley Wood Exhibitions: Kelly Cooper, Heather Gibke, Amie Gilmore, Dana Teague, Chelsie Thornton and Amanda Young. Thank you, Hanley Wood and all of my fellow Surfaces StonExpo Education Advisory Council members. I learn a great deal about both industries during this intense process and can't imagine doing so with a better group of people! Added 4/18/11: For additional perspective on the process, check out Paul Friederichsen's post on the Surfaces/StonExpo Blog titled Dedicated to Educational Excellence. I'm curious. How are you finding new customers? Are you having to take new approaches to attract customers to your business? Or, are the Yellow Pages and print ads still working for you? I've spoken with many retailers and business owners over the past few months who've told me: The Old Ways Aren’t Working. And, if it is, what are you finding works best for your business? From my perspective, I see everyone around me becoming immersed digitally - from my 9 year old daughter to my 84 year old mother who grudgingly acknowledges that Skype is the only way to call France. If 77.3% of the U.S. population uses the Internet, and a majority of those people [70 to 90%] start the purchase process at a search window, then we truly do live in a Digital World. From Socialnomics' Social Media Revolution 2 Refresh, I find it amazing that it took radio 38 years to reach 50 million users, TV - 13 years, the Internet - 4 years while Facebook reach 200 million users in less than one year. The implication is that you must be found when your customers start searching - via rich, relevant content written from your customers' perspective, using their language and their search terms. When do your customers interact with you? Which of your communication tools do they interact with first? I bet you've had to adjust. So, what are you doing now that you weren't just a few years ago to help you connect with new customers? According to eMarketer, SMBs Turn to Social Before Search because they consider "word-of-mouth as the top way their customers find them, followed by the internet and search engines." What have you observed? Are you more immersed in social tools? If you've embraced social as an effective means for finding new customers, have you created consistent social profiles from one social platform to another? Do your profiles point back to your website or blog? Which social platform have you found most beneficial? Every conversation I've had lately highlights the amazing opportunities available to businesses once they have accepted that the old ways no longer work for them. What are you finding success with for finding new customers? 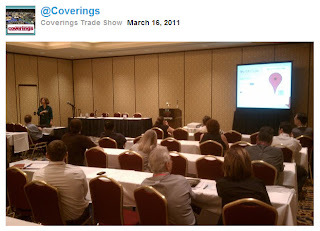 Note: this is the first of an ongoing series about Practical Marketing for Small Businesses: Improving Your Digital Visibility inspired by the conversations I had in preparation for Coverings 2011. If you like what you've read, consider subscribing via email or RSS. 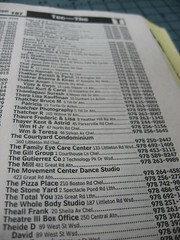 Photo Credit: The Phone Book Listings originally uploaded by herzogbr. 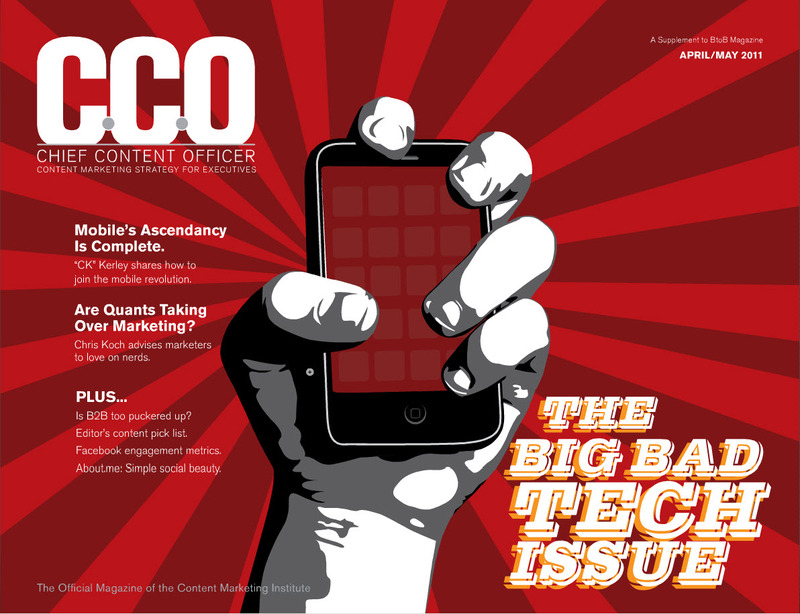 Content Marketing Institute has just issued CCO (Chief Content Officer) Magazine: The Big Bad Tech issue. No surprise, it focuses intensely on technology! Other favorites in the magazine include an interview with Jay Baer - co-author of The NOW Revolution: 7 Shifts to Make Your Business Faster, Smarter and More Social - and a Simple Dashboard to Track Facebook Engagement by Nate Riggs. Here's my Tech Tool: eCairn Conversation [TM]. My most valuable content marketing tech tool is eCairn Conversation, a platform that helps to identify virtual social communities and key influencers, as well as the relevant content they create. Using eCairn Conversation, I’m able to search on specific topics that my database of relevant sources mention – be that references to Mad Men, retail experience, social media marketing or content marketing themes – and establish content-based relationships with the authors. Added 4/12/11: Exciting News! eCairn has just released exciting new updates to eCairn Conversation. Definitely check the Big Bad Tech Issue of Chief Content Officer magazine. Simply click on this link. Then, let me know which article you found most intriguing. Would you also let me know which technology tools you find most valuable as you navigate and make sense of the digital and social online worlds? At Coverings 2011 in Las Vegas [see Press Release: Coverings 11 - Practical Marketing & Business Survival Highlighted], I addressed how to improve digital visibility during two presentations. One with Paul Friederichsen from BrandBiz [check out his BrandBiz Blog], and one on my own. During both presentations, I had a blast! I love to discuss practical marketing approaches with small business owners and managers. Inevitably, the audience brings up success stories and interesting ideas to share with one another. I was rewarded with terrific questions and lengthy, involved conversations afterwards. I'm particularly grateful to Bill Buyok from Avente Tile [check out the Avente Tile Talk Blog] who graciously welcomed regular conversations about his business and how he uses social media. Bill contributed valuable perspectives during both sessions. What have you found particularly valuable for improving your digital visibility? Which tools have you had the most success with? How are you using them to connect with customers? Which tools do you consider less valuable for your marketplace? I'd love to hear. If you like what you've read, would you consider subscribing via email or RSS to the Simple Marketing Blog? Thanks. 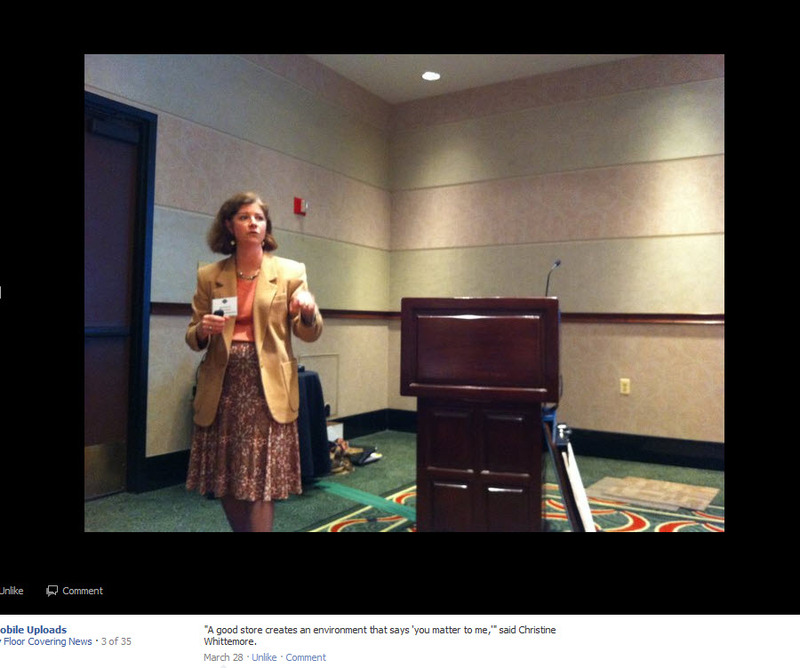 Photo Credit: Thank you, Josh @Coverings, for capturing me in action and sharing the photo on Twitter!